Sixty years ago August, 2005, the islands of Nagasaki and Hiroshima, Japan were bombed by the United States, putting an end to a war, but not an end to the pain or the dying of a people whose civilians were innocent of any evil doing. As a result of the atomic blast and later the fallout, the death toll in a year was 270,000 lives. I was not born yet when this tragedy took place, but its effects have been felt in me over the years. I remember as a teenager fumbling through some discarded old Life magazines and coming upon a photograph in black and white of a little Japanese girl running down the street naked, her clothes obviously burnt off of her. She had such a frightened look upon her face that I wanted to go back to that time, wrap my coat around her and tell her that she needn’t be afraid anymore. It would be 20-some-odd years later before I could do something that in a way would be a healing act for her, myself and the rest of the world—the living and the dead. At the Oregon State Prison our sangha of Buddhist practitioners meet every Tuesday night for two hours. We are a diverse group with many different lineage followers yet we all seem to have a common trait of accepting and working together that seems to fit for us. On one such Tuesday night I arrived at the chapel where we meet expecting to see everyone sitting on blankets meditating in a circle. Usually I am the last one to arrive as my block and tier more often than not is let out last and I have to hotfoot it up the stairs and then run down the long corridor to make it before the cut-off time. This night, though, when I entered the chapel and looked to my left I saw no one. No altar set up, no incense wafting to the ceiling and nobody sitting on blankets in a circle. Just about the time I was thinking I would have to return to my cell I heard laughter coming from one of the back rooms off to my right, so I headed back there. When I entered the room, the first thing I saw was a red and white patchwork quilt tacked up on the wooden lockers. I could tell that there were little figures and words drawn on each square, but not much else—my eye sight is poor beyond eight feet or so. There were also two six-foot-long collapsible tables that most of our Buddhist group were seated around. On these tables were a lot of colored pens and felt tip pens, as well as wooden blocks and ink pads made for print stamping on cloth. Our three outside volunteers, who come on a regular basis, were also in the room. Each one had a wonderful smile and an easiness about her that says she is genuine and unconcerned about being in a room full of felons. She told us that those at the Great Vow Monastery wanted to make 270,000 Jizos; one for each person who had died as a result of the two atomic bombs dropped on Japan. She further explained that the women’s Buddhist group at the Coffee Creek Prison in Oregon had produced more than 1,500 Jizos on their quilt which was hanging on the wooden lockers. Then she made it a challenge to us men to see if we could better the count on our quilt. Gechen then had me sit at one end of the fold-up table, laid a template down and then a square of white linen over that. The template shown through the cloth and was made of paper; there were black borders to guide us where to draw in order to be able to sew the squares into a quilt. Gechen said we could draw pictures of Jizos or use the wooden blocks and stamp them on. I centered my piece of cloth on its template and then looked around the room. At my left was a lifer named Pollock. He has been in for over 20 years straight. He joined the Buddhist group four years back. I had met him in the “hole” (segregation unit) after he had OD’ed on heroin. He had been the first to pique my interest in Buddhism and I liked him. He was busy drawing and smiling like a little kid. To my right was Gechen and she was also busy ruling a line on her border and snatching colored pens as fast as she could draw, set one down and pick another up—you could tell she had done this before. At the opposite end of the table facing me was Betty. She wasn’t drawing but she was smiling big, watching all of the others draw and giving off good vibes. The second table sat a few feet from ours, and it was full of guys drawing and talking while they worked. Our third volunteer, named Keesay, is the jokester of our volunteer group, and is always laughing and smiling. Her eyes have that twinkle that says she is a happy person and more times than not, she will stick her tongue out in a good natured way, kind of like saying “life is good, share it with us.” She was a cancer survivor and you could tell her nature was filled with happiness. She was also the seamstress and headed up her part of the quilt endeavor. Everyone seemed to be involved in the process at hand. So I sighed, let go of my apprehension and opened myself up to the experience. My first attempt at drawing Jizos free-hand was a little stiff. My next one had me feeling the goodness of the project. One of the volunteers had said that lots of Jizos and the right intent was what was important here, especially towards women and children. 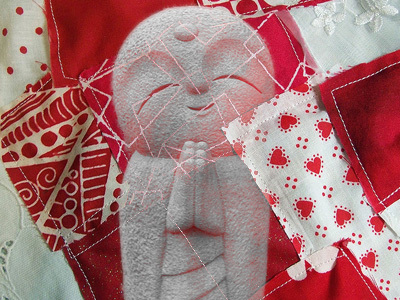 I suppose if Bodhisattva Jizo was all I thought he was, he looked out for women and children the most. He might even be a bodhisattva that was a she if the kindness and compassion of our volunteers were any kind of gauge of that sort of being. Once or twice I found my attention to the task wander as I drew and stamped out Jizos, but like meditation I would bring my awareness back with right intent as I would to my breath. I found I could actually relax and enjoy this occasion, this experience infused with the Dharma. I also felt as if I were doing something positive, something healing, not only for myself but for others as well. Before I knew it I had completed my fourth square of linen with 71 red and black Jizos on it. We had outdone the women’s count, but I didn’t feel that it was a contest between genders. Indeed we had women working right along side of us. Rather, I felt it a process of healing and of cooperation, a peaceful working together to complete an honorable task. As we filed out of the chapel after putting things away and saying our goodnights, I walked slowly down the corridor that I had run up two hours previously. The little girl I had remembered from that long-ago picture in Life magazine came back to me. Finally someone had made an effort to take away her pain, to ask forgiveness, and to cover her nakedness. It was a group effort made by strangers—some who would never meet in this life, for our contribution was only a small part of the 270,000 Jizos needed. But that was okay; there was loving-kindness in the task. Many incarcerated people from all over the United States correspond with Venerable Chodron. They offer great insights into how they can be of benefit to themselves and others in even the most difficult of situations.